As associations, we plan annual meetings and events years in advance. And while it would be great to have a crystal ball informing us of the weather our attendees will experience while traveling or when they arrive onsite, that kind of foresight just isn’t a reality. At the Annual Assembly of Hospice and Palliative Care, presented by the American Academy of Hospice and Palliative Medicine and the Hospice and Palliative Nurses Association, a major Nor’easter storm descended upon Boston and threatened travel plans for more than 3,500 attendees, exhibitors, faculty and staff members – many of whom were scheduled to arrive on the day Logan International Airport closed. Thanks to early and thoughtful communication and planning by AAHPM and HPNA staff, the weather did not impact the meeting’s overall success and attendee experience. Visitors knew what to expect and how to navigate the storm to ensure they got the most from the much-anticipated event. It doesn’t matter when you have a conference – storms can cause travel issues in the spring, summer, winter, or fall in all parts of the country. With this in mind, our team refined our emergency preparedness plan months before the Annual Assembly to ensure it covered how to handle inclement weather and transportation delays. Various staff members were assigned roles related to monitoring, problem solving, and communication. Because we had a plan in place, it was much easier to implement onsite and from various locations in between. Our team met onsite and connected with others by phone so we could discuss who and what would be affected in the next 24 hours and determine next steps. The staff office served as “Storm Central” and updates on staff and faculty arrivals, sessions impacted, substitute faculty, etc. were posted on the walls throughout the day. Photos were even captured and shared with volunteer leaders and travelers so they could see the team was managing the situation effectively. On Monday, most of the team was traveling to Boston and setting up onsite. With the storm barreling down on Tuesday and pre-conferences and Opening Reception scheduled for Wednesday, we knew that the pre-cons could be adversely affected and attendance would be diminished. 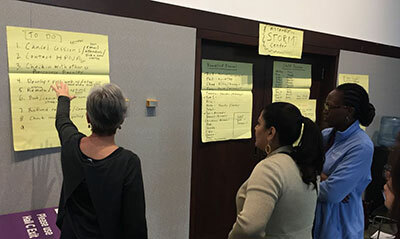 After reaching out to faculty, the team was able to identify which sessions could go forward and which needed to be cancelled. With some creative rearranging and wonderful volunteers, we were able to put on all but 2 pre-cons. Some faculty were able to participate virtually. Other sessions were facilitated by fewer faculty or covered by others who were onsite. 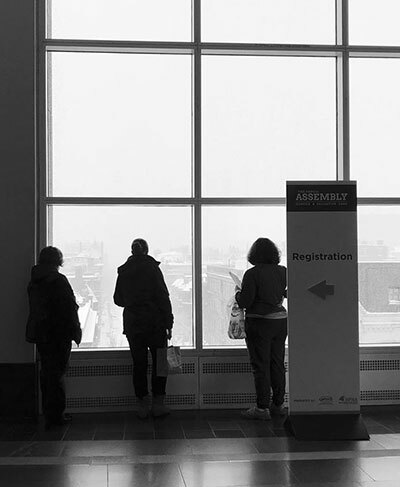 Members who made it to Boston early or through the storm were delighted to see the sessions were still taking place. Our team worked closely with our onsite AV company to assist us in bringing pre-con faculty to the meeting via Skype and GoTo Meeting. Technology also helped us get messages out to attendees with updates and schedule changes. As attendees started to arrive, we were welcoming and expressed our appreciation (and amazement) that they persisted and were able to join us. We also helped them with accommodations if they arrived early ahead of the storm. Our hotel partners were also quite accommodating. People arrived with smiles on their faces and were grateful to be there. A few onsite therapy dogs, coloring stations, musical entertainment, and a chance to reconnect with their “tribe” also helped to ease frustrations. Surprisingly, 90% of pre-registered attendees made it to Boston! A lead crisis team was established and connected via group text prior to leaving for conference. In addition, we engaged and communicated with all those affected: Board members, attendees, exhibitors and the media. We sent out e-blasts, posted on our website, our sharing platform, and in the Assembly app, and communicated via social media. Members expressed appreciation for knowing the plan before they left home. We let them know the conference was still happening and were there to support them, and shared what to do if they weren’t able to make it. This cut down on the number of e-mails and phone calls back at the office. Next year our conference is in a warmer destination – but we know that doesn’t mean we won’t be prepared for something similar. We encourage all associations to plan for the unexpected, but hopefully the unexpected won’t arrive.